Professionally landscaped gardens often concentrate on form, structure and natural ‘lines’ as well as style and function. 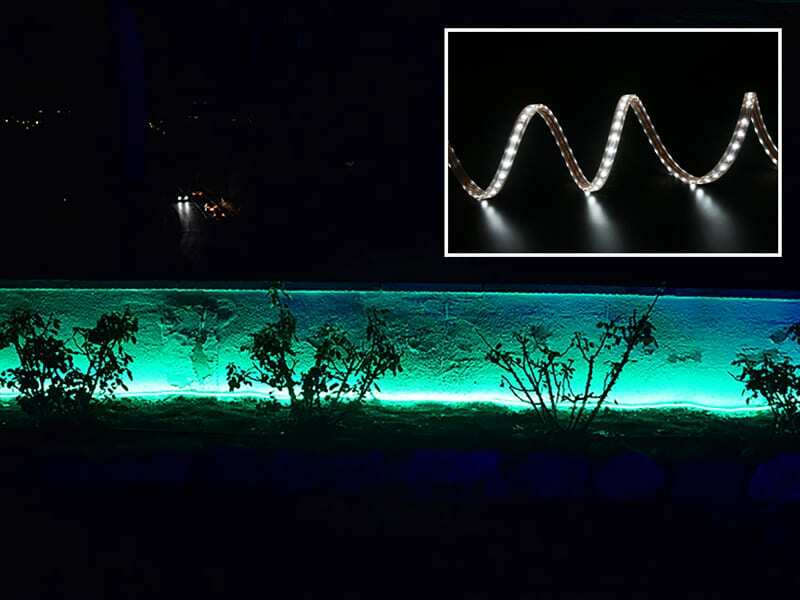 LED strip lights are a fantastic, versatile method to highlight structural features in the garden. Their narrow size is particularly effective for steps, walls or vertical edges. An LED strip light is a long strip or reel of small LED chips placed at regular intervals. When illuminated the LEDs provide stunning accent lighting wherever needed. There are many benefits to LED strip lighting. To get the full effect there are various points to consider first, such as installation, length, colour scheme and power supply. Firstly, not all LED strip lights are for outdoor use. It’s important to always use a weatherproof, outdoor kit such as the fully waterproof IP68 ‘Lediflex’ range by Lumena. Lediflex strip lights are available in Warm or Daylight white as well as single colours of Red, Green or Blue and are supplied with an detachable Plug & Play 24v DC power source. Additional ‘DConnect’ Plug & Play extension cables are also available as an accessory. This enables a more remote placing of the driver, further away from the fitting. These weatherproof strips are silicone with a PU sealed centre, and available in 2m and 5m reels. Each strip contains 60 bright LEDs per metre. Smaller lengths are created by cutting along copper connector points (every 10cm). Durable aluminium profiles are available for extra protective and secure mounting. An example of this is the ‘Ali-Pro’, which encases LED strip lights up to 1m, but will cut to a smaller size. The opal cover conceals the strip and diffuses light evenly, without glare. Their versatile design and the different LED colour options makes strip lighting an excellent choice for many different occasions, events and moods.